We're excited to share the news about a new book by our gifted correspondent and friend, Lucine Kasbarian. 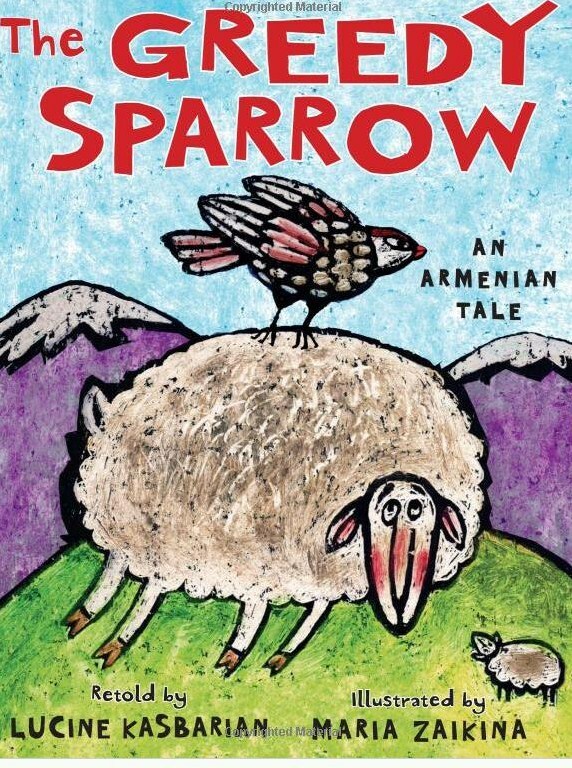 It's called The Greedy Sparrow: An Armenian Tale. It's billed as a children's book for ages 4 to 8, but the enchanting story is suitable for readers of any age. It's also timeless, and there's no telling how old it is. Lucine remembers it as a bed-time story told to her by her father, who had learned it from his grandmother. Generations of Armenians had passed the tale along in this way until it was put to paper by poet Hovhannes Toumanian a century ago. Now Lucine has lovingly presented and preserved an English-language version for generations to come -- and it is a tale well worth preserving. And yes, there is even a food angle to this story of a sparrow with a thorn in its foot: the bird is rescued by a baker, who rather than being thanked is forced to give the greedy bird her bread. The sparrow's encounters with a series of similarly hoodwinked souls takes the reader on a tour of Historic Armenia, lushly illustrated by Moscow-based artist Maria Zaikina. The Greedy Sparrow is available in bookstores and from online sellers such as Amazon.com. Scroll down to our link to "Our Favorites from Amazon.com", then order your copy today. It will become a treasured book in your family's library. Congratulations to Lucine on a wonderful accomplishment! Of course there's nothing like your dad telling you this bedtime story, but this is a beautifully illustrated book and captures the heart of the story. We bought a whole bunch on amazon and are giving them as gifts to all of our friends with kids! Thank you, Kalajians and Dik to the bone, for your wonderful words. I must add that this tale was told to me at bedtime in the Dikranagerd dialect. Getseh Kaghkutsis!